Pictured are: HomeBiEd students Nathan Lowther, Ryddick Seal, Tyler Kimmick, Bryan Olivas, Jason Helms, Seth Douty, Wyatt Cosat, Hunter Speer, Austin Welles, and Mr. Addington. Also shown are county commissioners Dwayne McFall, Tim Payne, and Debbie Bell. 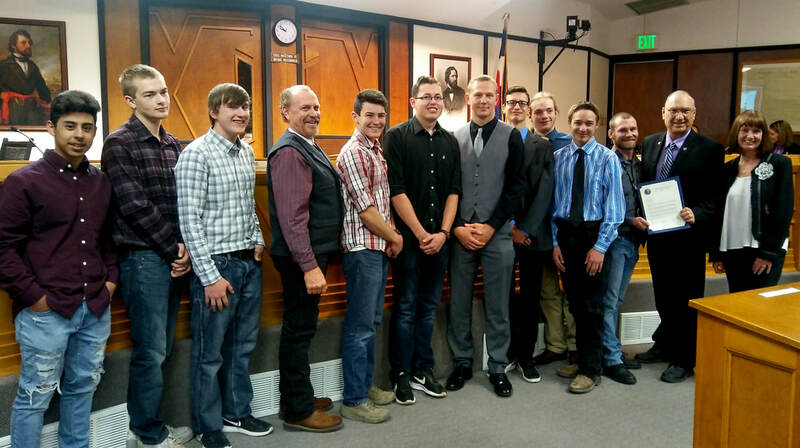 On Tuesday the Fremont County Board of Commissioners recognized Andrew Addington's Cañon City High School HomeBiEd carpentry class for refurbishing a 47-year-old sign in south Canon City that explains the partnership between Fremont County, the Fremont Soil Conservation District, and the Fremont Flood Conservancy District during a watershed flood prevention project that took place in 1971. Thanks, Mr. Addington for providing this service to our community! This week I had the pleasure of twice being on the receiving end of sincere appreciation directed toward Social Emotional Learning Support Coordinator Jamie Murray. One expression came from our district Health Technicians grateful for Jamie's presentation on progress being made identifying the social-emotional needs of students through the BIMAS screener. I also spoke to a local higher education official who thanked me for Jamie's recent presentation to college students about the work we are doing around our first core belief. Thank you, Jamie! Last week the Cañon City High School Speech and Debate Team competed at the National Qualifier Congress Tournament at Colorado College, at which they secured the region's traveling trophy! Emily Reynolds also earned an alternate slot to compete at the National Tournament in Dallas, Texas this summer. Coming off this success, the CCHS Tiger Talkers invite staff and community to attend a showcase on February 28th beginning at 6 PM in the high school auditorium. This is an outstanding opportunity for CCHS students to show what they have been doing all season, and to give back to those who have supported them. On the athletic front, I understand five of our Cañon City High School wrestlers qualified to participate in the state tournament next week, and both our Tiger Ladies and Tiger Men's basketball teams have qualified for first round home games in the state tournament! This week we received the news that our recent application for a $500,000 school security grant was approved. Pieced together by Director of Student Support Services Paula Buser, Director of Technology Shaun Kohl, Director of Operations Jeff Peterson, CES Principal Kelly Albrecht, Lincoln School of Science and Technology Principal Tammy DeWolfe, and McKinley Elementary Principal Scott Morton, the grant will first upgrade 210 surveillance cameras around the district, helping to prevent campus entry by unauthorized individuals, and enabling school district personnel and law enforcement to visually monitor facilities. We'll also be able to purchase 225 additional 2-way digital radios to enhance our communications with law enforcement. This project will include the installation of a second radio repeater, expanding our bus route communication. The grant will also install stop arm cameras on all our buses that will be able to identify motorists who illegally pass them when children are loading or unloading. Finally, we'll also be able to purchase body armor for our school-based security personnel to enhance their personal safety. The basics of this proposal include 7 hour and 30 minute days from start to finish for grades 6-12, allowing for a 410 minute contact day as requested by the calendar committee. 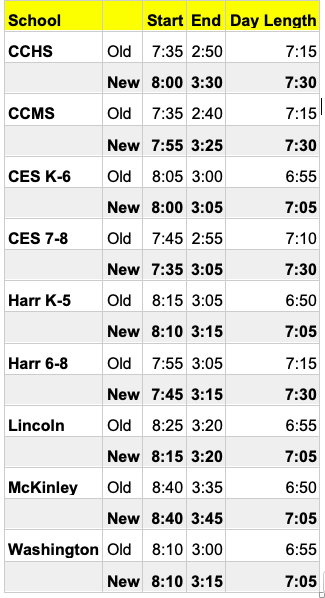 The recommended length of day at the elementary level will be an increase of 10 to 15 minutes over last year (depending on the school) to a uniform 7 hours and 5 minutes across the district. This will leave elementary schools with approximately 3.5 snow days built into their annual calendar. This schedule is still only in draft form. A final version will be presented to the board of education at its February 25th meeting. Our most up to date rendering of the CCMS project. 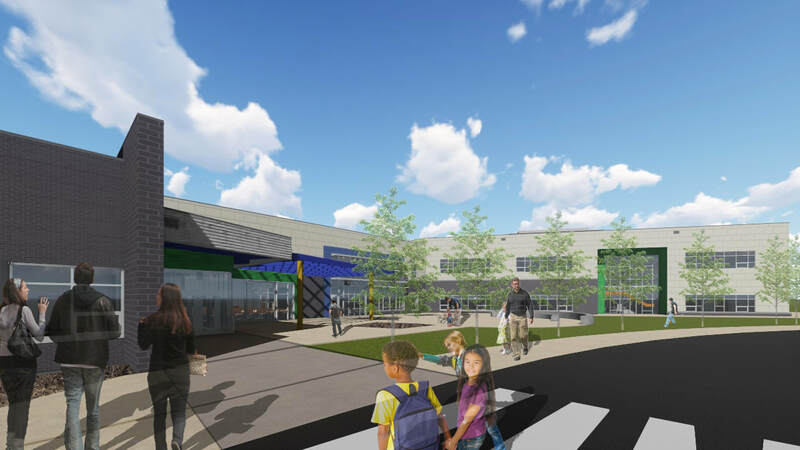 How Washington Elementary will look from the main entry. Work continues to take place on our new district grounds shop located to the North of Icabone Pool near the high school campus. Steel has been ordered for this project, the foundation has been dug, and we look forward to pouring the footers and flooring in the next several weeks. 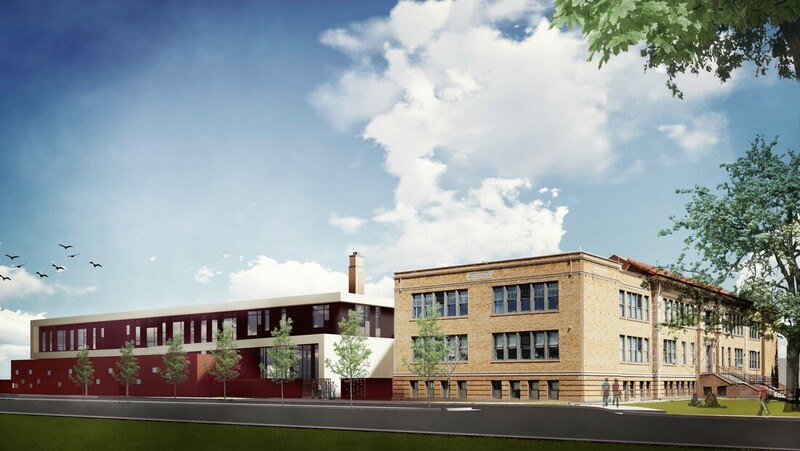 With final floorplan designs approved for the Cañon City Middle School major upgrade and the new Washington Elementary building, earthwork, concrete, mechanical, and steel contracts have been awarded and plans for a formal groundbreaking at each site are in the works. The Tiger Talkers display their traveling trophy! Last Monday I reviewed the Nutrition Services Department budget, worked with Director of Student Support Services Paula Buser to develop a Social Emotional Learning action plan, attended a secondary summer school planning meeting, a board work session, and a board meeting. On Tuesday I attend a monthly law enforcement touching base meeting, a Rural Alliance legislative advocacy phone conference, a weekly Superintendent Advisory Council meeting, a District Leadership Team meeting, and a monthly touching base meeting with certified association leaders. We had a delayed start professional development day on Wednesday during which I touched base with classified association leaders and attended an Opportunity Coalition legislative advocacy call. On Wednesday evening we held our first Civic Canopy community engagement session. On Thursday I touched base with Harrison leaders, dialed in to the Pikes Peak Alliance legislative advocacy conference call, worked on department director annual evaluations. I continued working on these on Friday. Our major work this week will take place at Harrison and McKinley, as we conduct building reviews there on Wednesday and Thursday. We'll also hold a technology vision committee meeting Thursday evening. On Friday we'll meet with our health plan provider to discuss renewing for next year. I also have a meeting with the Director of the Boys and Girls Club to discuss how the district can partner in providing services to kids. 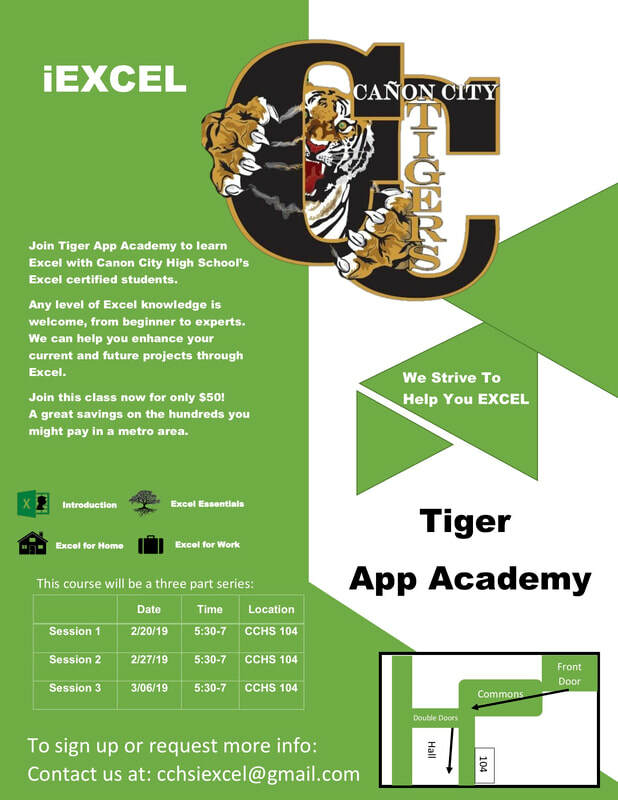 Cañon City High School Vocational Technology students have planned a first-ever Tiger App Academy course in Microsoft Excel for the community. This will be instructed by students who are already Microsoft Certified Excel specialists who are also are pursuing their expert license in Excel. All proceeds will supplement certification testing fees for students. This course will be presented in 3 parts. Session 1 takes place on February 20th, Session 2 on February 27th, and Session 3 on March 6th. Each session takes place from 5:30 PM to 7 PM in Cañon City High School room 104 and you can enroll in all three for only $50. Student instructors ensure all skill levels are welcome and the course outline includes an introduction to Excel, Excel Essentials, Excel For Home, and Excel For Work.